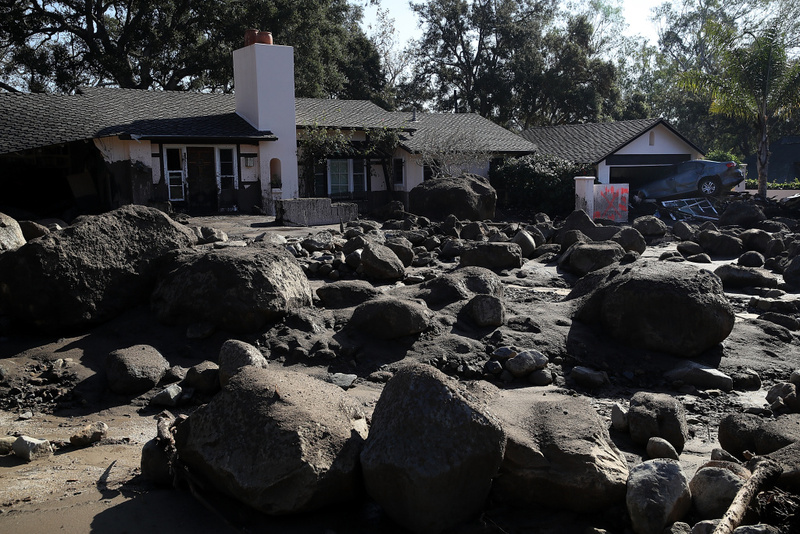 Boulders and mud stand in front of a home that was destroyed by a mudslide on January 11, 2018 in Montecito, California. The death toll in this week's massive mudslides in Montecito has risen to 20, Santa Barbara County officials announced. On Saturday night, searchers found the body of missing 25-year-old Morgan Christine Corey, even as mourners gathered in Carpinteria for a candlelight vigil. Corey's 12-year-old sister, Sawyer Corey, was also killed in the mudslides, which swept through town before dawn on Tuesday. 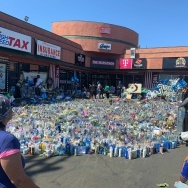 At Saturday's vigil, candles were labeled with the names and ages of all the victims including the youngest, 3-year-old Kailly Benitez, and the oldest, 89-year-old Jim Mitchell. 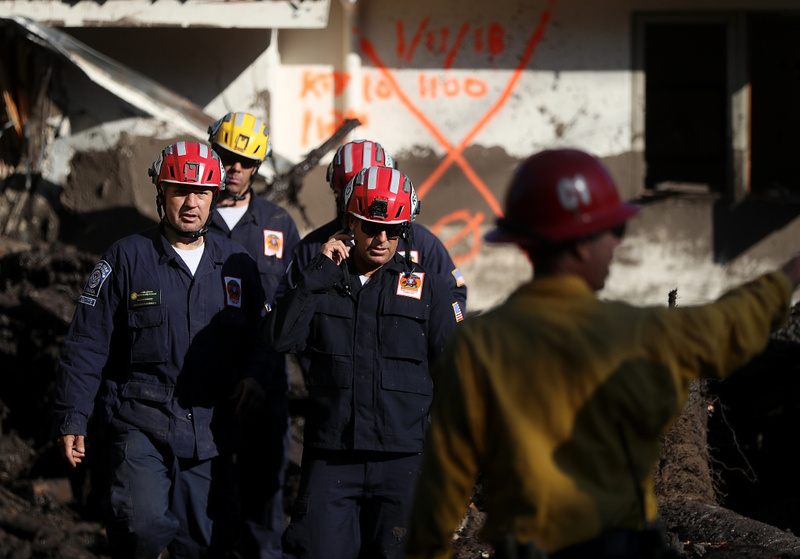 Los Angeles County firefighters prepare to investigate a home after a cadaver dog alerted on a pile of debris from a mudslide on January 11, 2018 in Montecito, California. 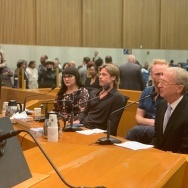 Jim Reineback participated because, as he told our media partner NBC4, "The entire community needs to pull together. We need to show love and support to each other. And if there's any way we can encourage or do anything that will show that support and love, this is really the time right now." Another vigil organized by Montecito elected officials is scheduled for 5 p.m. Sunday night at the Santa Barbara County Courthouse Sunken Garden. 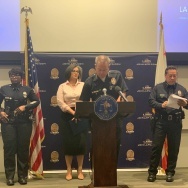 The event will include an interfaith service. Anyone who wants to attend is invited to bring candles. More than 2,000 first responders are still combing through buildings and debris flow for additional victims, according to Santa Barbara County Sheriff Bill Brown. 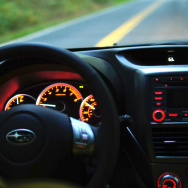 "They're still actively searching for people. And while every hour remains less likely that we'll find anyone alive. There's always hope," Brown said. 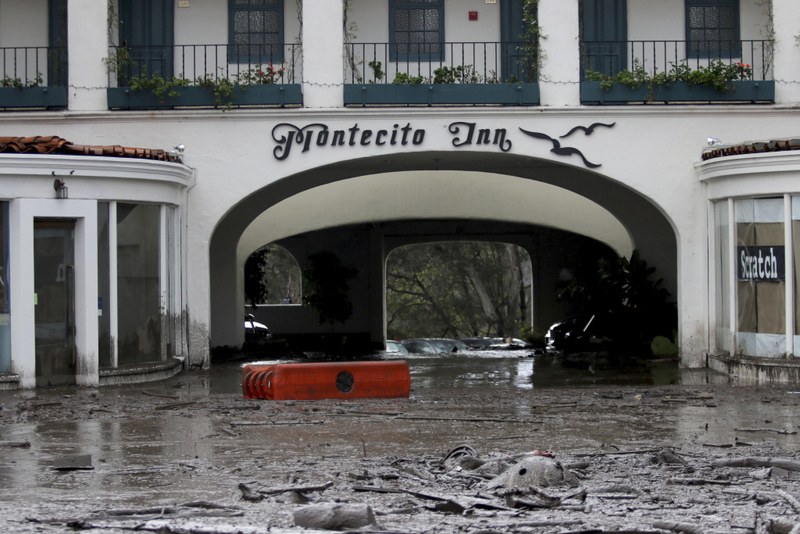 The Montecito Inn on Tuesday, Jan. 9, 2018, as debris and mud cover the entrance of after heavy rain brought flash flooding and mudslides to the area. Four people remain missing Sunday morning as crews continue to remove mud, boulders and downed trees. The mudslides destroyed at least 65 homes and damaged more than 460 others.